The first tool a welder should purchase is a set of MIG Welding Clamps. Of course this assumes you already have an Auto Darkening Welding Hood? At any rate, the first time you try to tack 2 pieces of steel together, your blood pressure will rise, if you don’t have any MIG Welding Clamps in your shop. Just try to hold two steel bars in place with one hand, while trying to keep your MIG Gun steady in the other hand, the whole time you’re wearing cumbersome leather gloves, and possibly laying on the floor upside down. Yep; it can be frustrating. You may have a few C-Clamps in your tool box already, but there is nothing like a set of specialty MIG Welding Clamps to get the job done efficiently. It’s like having another pair of hands. MIG Welding Clamps are specially designed to hold two parts at a perfect 90-degree angle. They even make a special F-Clamp with a wide sliding jaw that adjusts with ease. 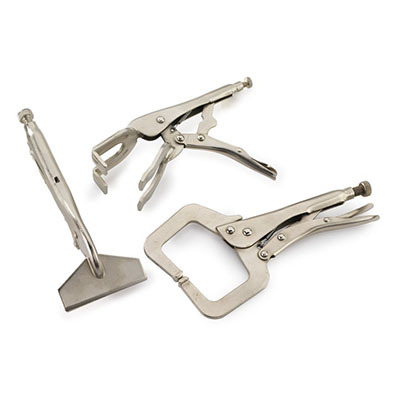 The Capri Tools locking welding clamp, 3-piece set, is the perfect variety pack for your welding shop or home garage. If you plan on doing any fabrication work at all, you will need plenty of clamps to handle the unique situations you may run across. While the Capri clamps are not quite the same quality as the original Vise-Grip brand, the assortment in this package includes three different configurations to accommodate most applications.